Hackett: "Ford's future is not about giving up the car." DETROIT -- Ford CEO Jim Hackett says cars aren't going to disappear on tomorrow's connected roadways -- as long as their brainpower can keep up. "Ford's future is not about giving up the car," Hackett said at the Michigan CEO Summit in Detroit. But there are "no dumb cars in the future." 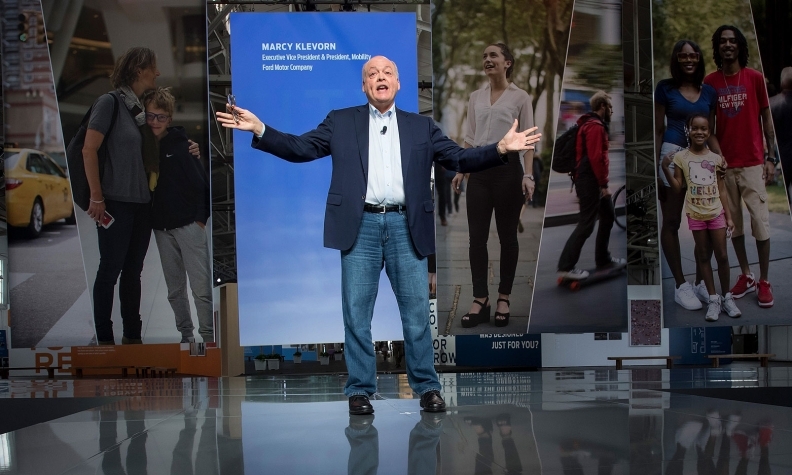 Hackett, who became Ford's CEO when his predecessor was ousted in May, is pushing to accelerate the automaker's moves into connected, electric and self-driving cars around the globe. Ford announced on Wednesday a joint venture to manufacture and sell a new line of battery-powered cars in China after making a similar move in India earlier this fall. So far, the shifts into new mobility areas have done little to reverse a three-year stock slide as investors perceive the automaker as lagging behind General Motors Co.
Shares of GM have risen 21 percent this year through Wednesday's close, while Ford has fallen 0.6 percent over the same period. Ford, which remains dependent on profits from big trucks, surprised Wall Street last month with stronger-than-expected earnings, thanks to cost cutting and strong sales of lucrative F-Series pickups. The company is betting the new mobility areas will also start paying dividends eventually. "We have to evolve these things to be ever smarter," Hackett said, noting that our future cars will be able to see things that human eyes can't, such as what might be over the hill in front of the car. "For a while, we didn't see the computer as an integrated aspect" in the automobile business, Hackett said. "Now, think about it, my vehicle is a rolling computer."